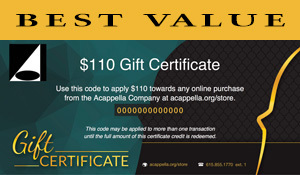 Do you have someone in mind that you would love to surprise with a gift from The Acappella Company? But then again, you don’t really know what they want, or what they already have, or what they need, or… well, it’s just too confusing. Why not send them a gift certificate instead? It’s the perfect present! Let them pick their own album! When you purchase a gift certificate, you will receive an email with a link to your certificate that can be printed from a printer connected to your computer or that can be saved as a file on your computer. Click the link in the email, and print or save your certificate. Then either wrap the printed certificate for the recipient or email the saved version on your computer as an attachment to the recipient. Each certificate has a unique code printed on it that can be entered at checkout just before completing payment.